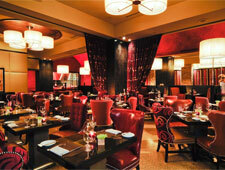 A steakhouse and wine-savvy establishment in the Renaissance Las Vegas Hotel. : A few steps into the handsome marbled lobby, happily free of the usual Las Vegas extravaganza, walk past an inviting bar and enter the elegant and refreshing environment of ENVY. The room that can accommodate 170-plus diners leaves a pleasant impression of generosity and openness, thanks to the expansive windows and the high ceiling. An entire wall of the room was converted into a wine cellar featuring 1,500 bottles, immediately gaining the attention of oenophiles. The menu includes a 17-ounce, bone-in rib-eye and a Dijon-crusted lamb chop with roasted tomatoes. For non-carnivores, there are many alternatives from the ocean, such as the sea bass with wild mushrooms and truffle butter crust, and sustainable salmon and creamy braised rainbow Swiss chard and pancetta. Among breakfast entrées are steak and eggs, Atlantic smoked salmon and roasted vegetable frittata. Desserts are in line with the comfort food, as in a New York-style cheesecake with raspberry coulis and glazed peach. 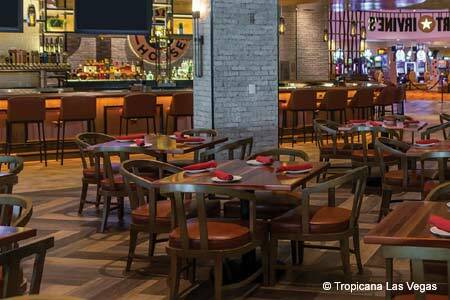 Find all the new Las Vegas restaurants that have opened recently with GAYOT's round-up.